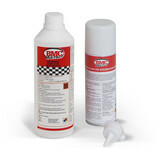 gearhead - Pennsylvania Bmc filter service kit "Only just installed the BMC filter, have not used this kit yet. Kit appears to be of good quality." Veloc - PDX Required for BMC filters "BMC filters come pre-oiled, but some people don't realize they can be washed and re-used. If you've got a BMC filter, you need this kit."